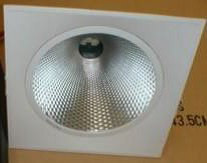 A Lighting Engineer would like to use the IES file provided by a manufacturer to model a family for a downlight. This blog is concerned with creating such a family. Shown below is a photo of the light fitting. 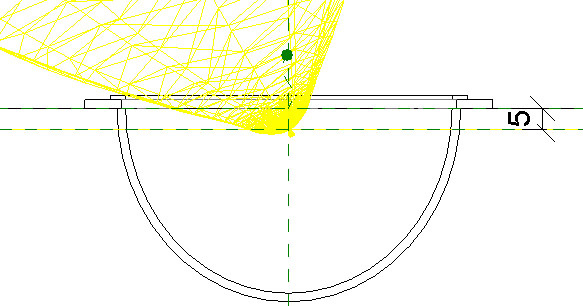 · The more complex the fitting is modeled, the more memory it occupies: unless there is a compelling argument (visualization), model the geometry simplistically. · Families created from different hosting templates cannot be swapped out with each other. 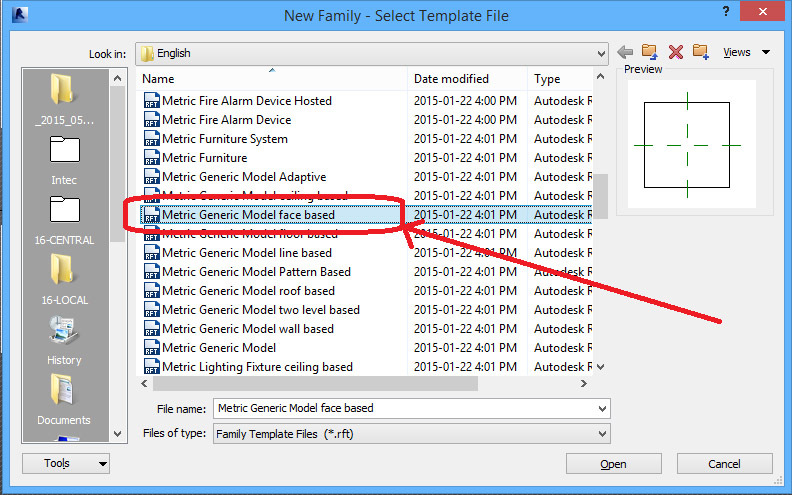 · Generic family templates may also be used so long as the family type is later set to lighting fixture. · Light fitting geometries are independent of light sources. o Family types may be created to represent different sizes of fixtures (parametric) and/or light sources (IES files). It is up to the author of the family to decide how to manage the family types. o Families are editable, therefore users of the families must adhere to the conventions and practices mandated by their BIM content manager. 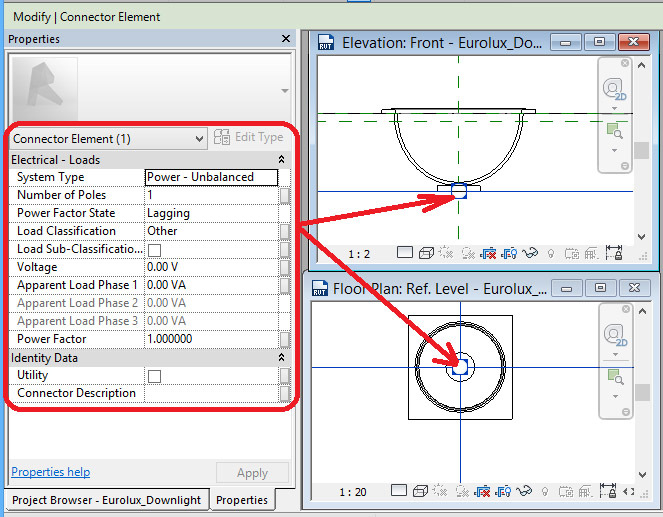 · Revit MEP allows a light fixture to have electrical data and connections and may therefore be connected to distribution systems. · The room calculation point of the family also applies to the space it is orientated to. 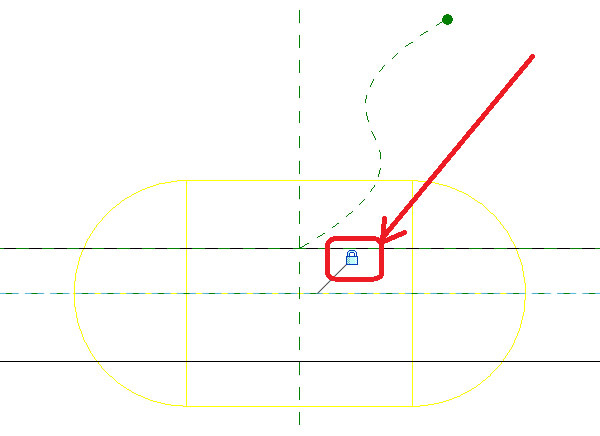 If a light source is contained in the ceiling, but is supposed to be included in lighting analysis of a space below the ceiling, then the room calculation point may be set to accommodate the calculation. A similar argument applies to bulkhead lighting. While it may be easier to demonstrate the creation of a ceiling based light fixture, it is limited to insertion into ceilings. Instead the concepts will be demonstrated using a generic face based family. The users of this family are then able to insert the family into many different hosting families. The family also moves with the host and may even be hosted to a reference plane if desired. Create a new family using the “Metric Generic Model face based” (UK) family template. Save the family out under an appropriate name. 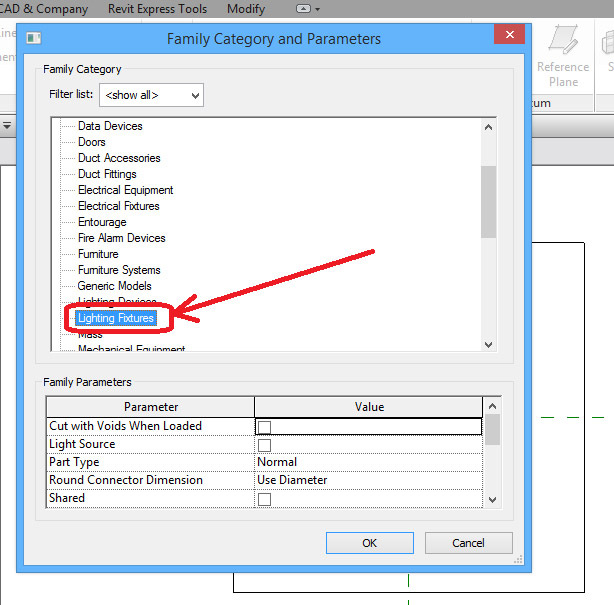 Click on <Create><Properties><Family Category and Parameters> then change the family from “Generic Models” to “Lighting Fixtures”. Notice the generic extrusion (representing the host). 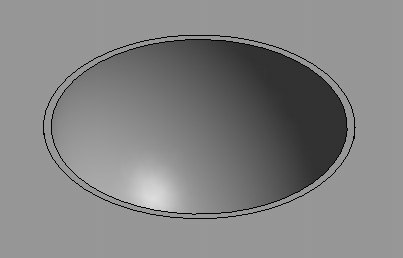 This extrusion is included by default in the generic face based family and it may be cut with void geometry, so inserting a light into it is entirely possible. 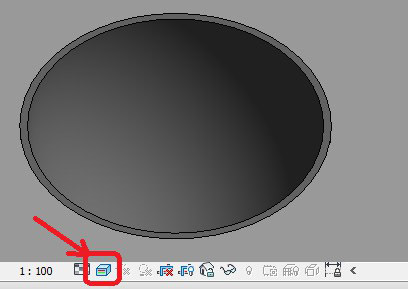 When such a light is inserted into geometry in a linked file then the host will not be cut. 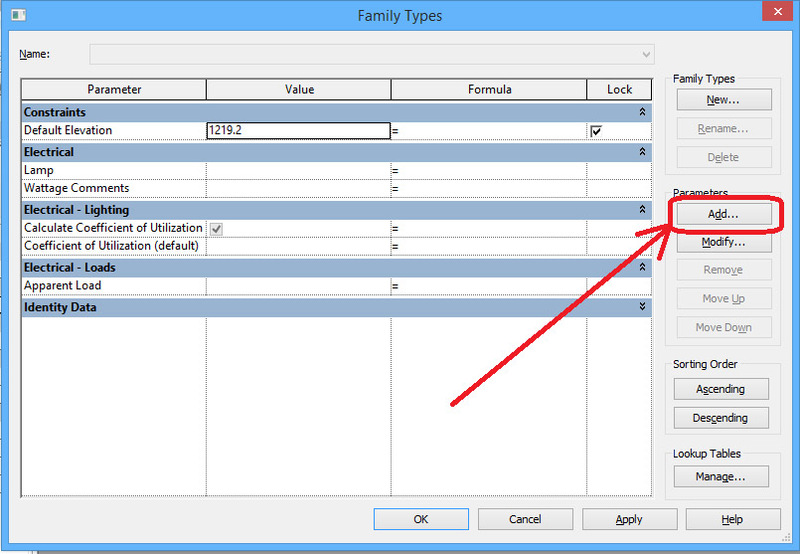 The default parameters for this family category are now available, the following of which are of particular interest. 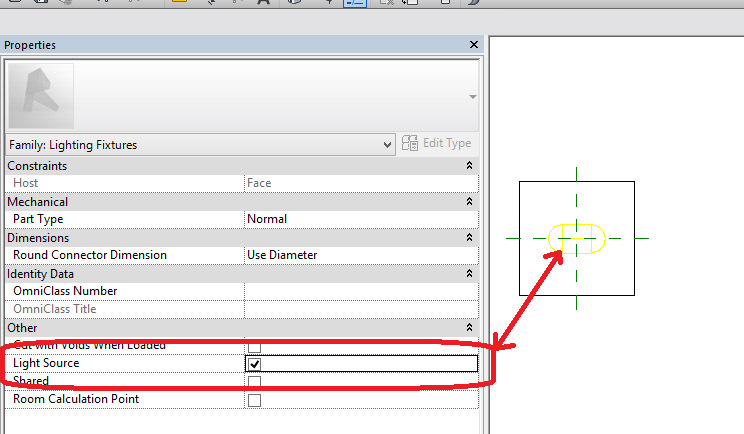 Light Source: If a light source is to be used for rendering and lighting calculations this parameter must be selected. <Instance Properties><Light Source>. 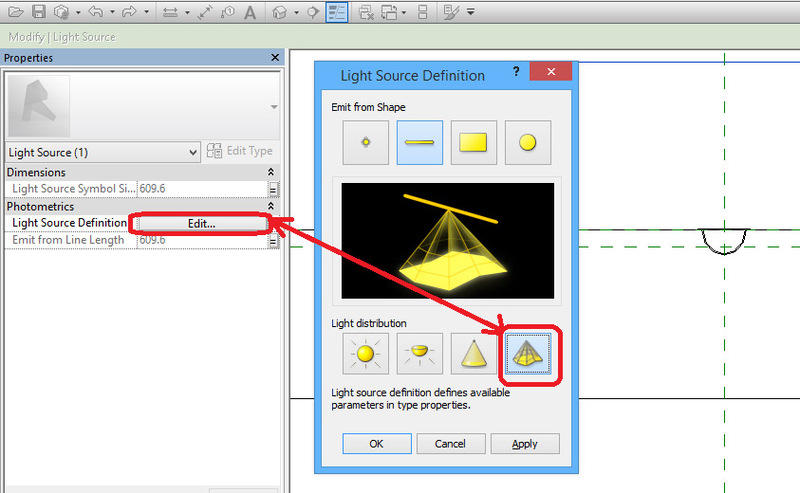 The yellow object that becomes available in the plan view represents the light source. 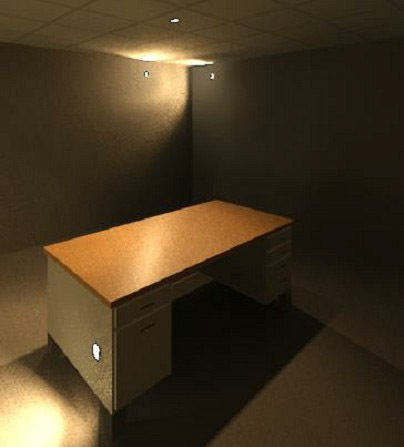 Although the light source is positioned at the origin by default, typically it is not so positioned and it should be locked to a reference plane created for it. Room Calculation Point: If the light source does not fall within the room or space then for calculation and scheduling purposes the room calculation point provides an override that may be applied to force the inclusion of the light source into said room or space analyses. This is a type property and care should be taken to use it correctly. It may be positioned from any relevant view. 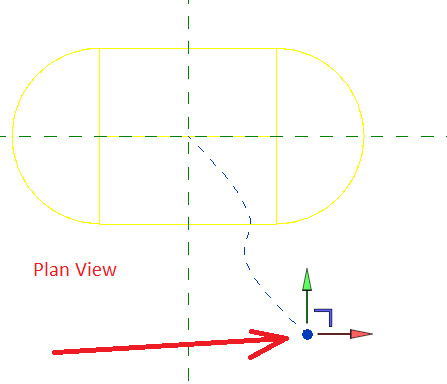 Dragging the point in plan view allows lateral positioning of the calculation point, while the same operation in elevation view sets the vertical position. 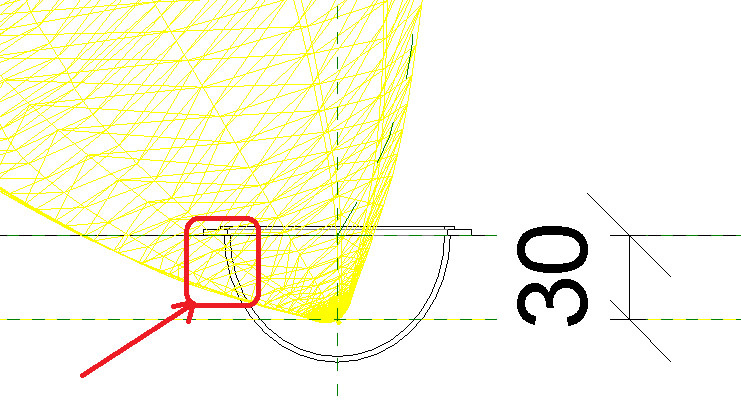 “Lateral” and “vertical” making sense used if the generic extrusion represents a horizontal ceiling, for instance. The generic host extrusion is positioned as if it were lying flat on the ground. This extrusion is simply a representation of the hosting geometry and can just as well be a ceiling. 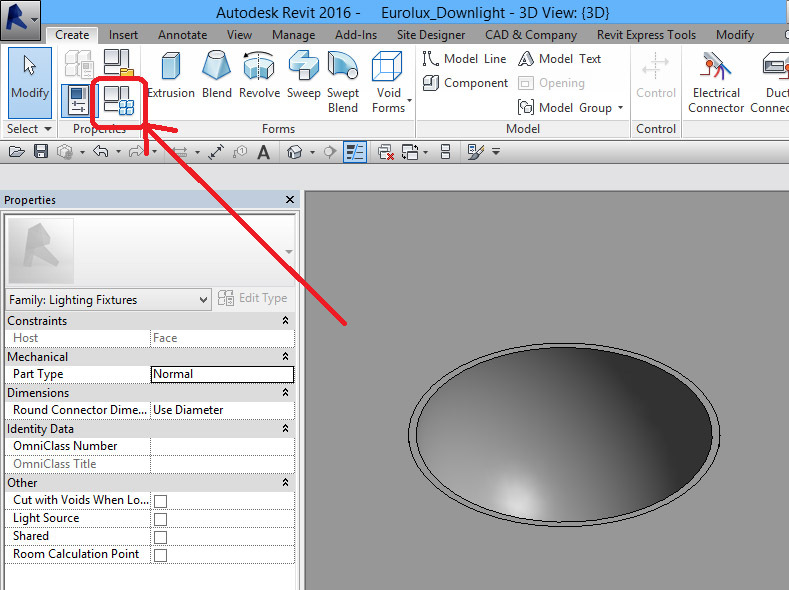 In elevation, a reference plane is created to lock the light source to. 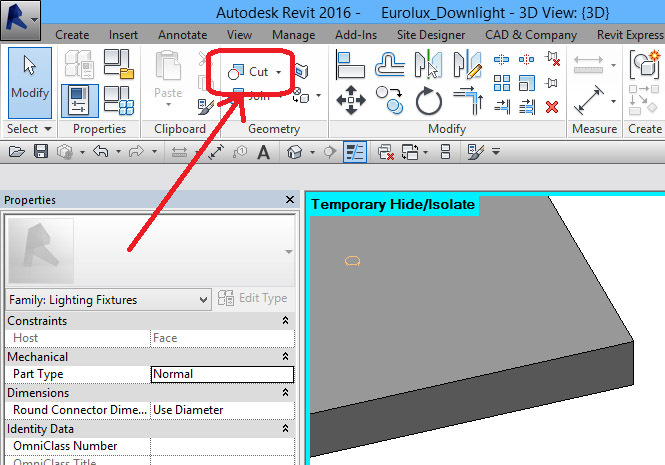 <Create><Datum><Reference Plane>. Because the downlight light source is to be inside the hosting element, the reference plane is created as such. After this reference plane is created, it is selected and renamed (a good habit to culture if the reference plane is not sacrificial). Align and lock the light source to the new reference plane. Since no void geometry has yet been created, a warning displays that: “Light source is inside solid geometry. No light will be emitted during rendering”. Ignore this warning since we will cut a void out of the host shortly. If this light fitting is hosted by inked geometry the light fitting will not render! If this light fitting is to be used by a lighting consultant then it may be prudent to alter the family such that the light source is outside the hosting geometry. The error incurred will probably be negligible. 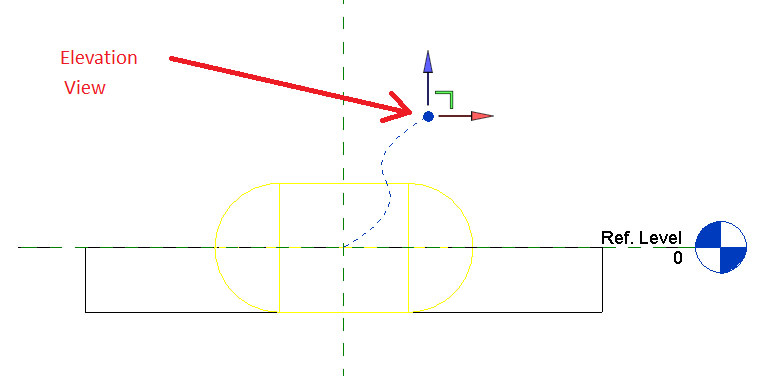 Lock the alignment so that the light source is constrained to the reference plane. 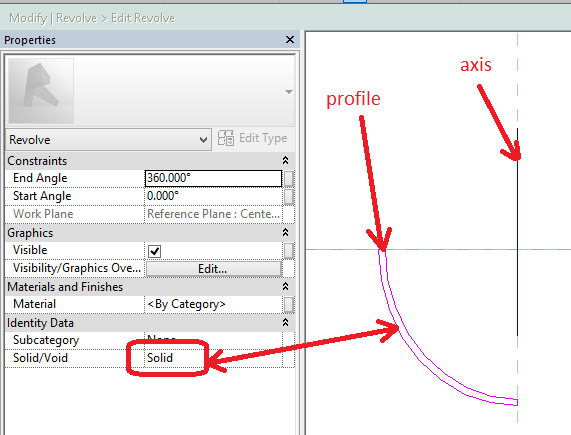 Working in plan view also lock the light source laterally to the reference planes defining the origin. 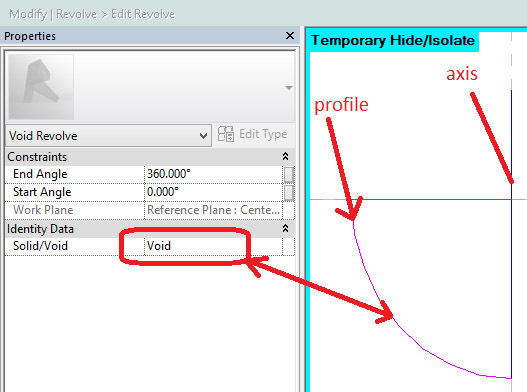 Also revolve a void that will cut the host (this will allow the reflector to be seen). 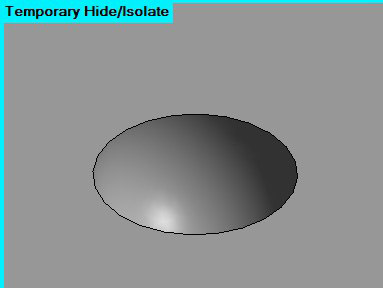 With the reflector geometry temporarily hidden and a 3d view displayed in shaded visual style, the cut in the host can now be seen clearly. I set the material default as Steel, Chrome Plated. 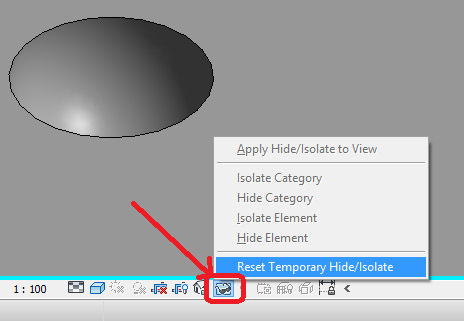 Map the material property of the reflector to this new material parameter. In realistic visual style the appearance of the reflector with the material applied can be seen to be different to when it is not applied. When the family is inserted into a project the reflector will also render as the material it is set to. Model some more light fitting geometry and either set and/or create material properties for the created solid geometries. I created a mounting flange and a glass lens. Switch the light source back on and set its reference plane so it falls inside the void that is cut from the host. 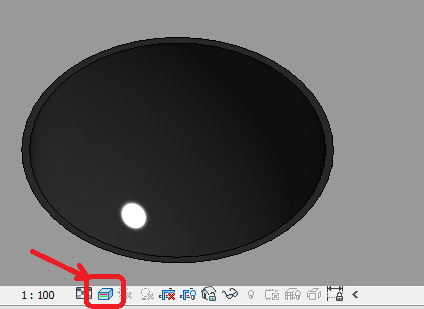 Select the light source and edit the light source definition so that it is of the type: photometric web. Realign and lock the light source to the relevant reference planes (changing the definition breaks the constraints set earlier). 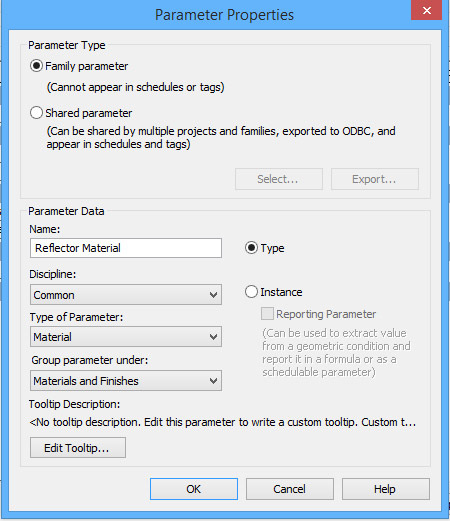 Edit the parameters (click on family types, like earlier) and select the appropriate IES file for the Photometric Web File parameter as provided by the manufacturer. Note: it is at the discretion of the creator of the family whether to create types based on IES files. In elevation the light source is seen to be shining down. As this family is derived from a generic face based family, this orientation must be reversed so that the light source shines away from the host. The Light source is therefore mirrored about the light source reference plane (and aligned and locked to it again: the mirror command breaks the lock). On closer inspection it can be seen that, were shadows cast, the light source would be impinged upon by the light fitting geometry. For this reason, the light source is moved closer to the lens. 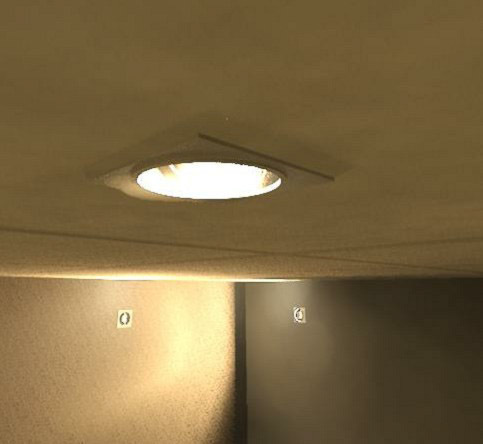 The room calculation point switched on and also positioned such that it just falls outside the light fitting (on the side the light shines to). The light source will now be scheduled and calculated as if it were positioned at the room calculation point. 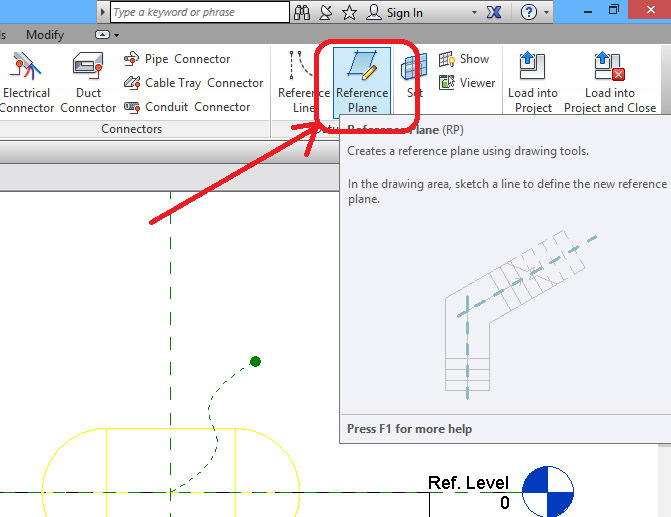 The connector has properties that can be set to match what the light demands and these may also be mapped to parameters if needed. Nested symbols can be useful in an electrical family, but they should only be used when the lights are to maintain their vertical orientation. 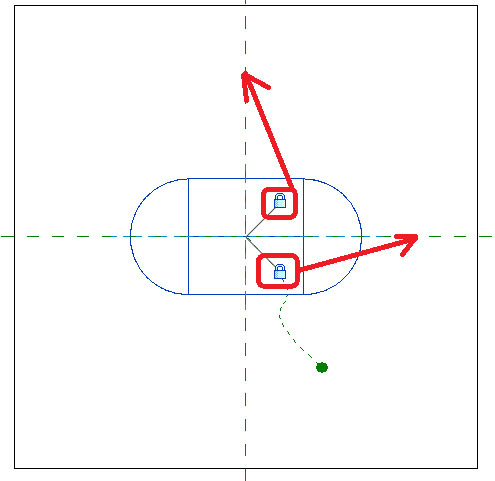 If, like with a face based family they are able assume the orientation of their host, then so does their symbol and it will therefore not display correctly in the project the family is used in. The face based light can now be inserted into a variety of hosts. Here it is shown in a ceiling, walls and even on the side of a desk! The more complex the fitting is modeled, the more memory it occupies: unless there is a compelling argument (visualization), model the geometry simplistically. Families created from different hosting templates cannot be swapped out with each other. Generic family templates may also be used so long as the family type is later set to lighting fixture. Light fitting geometries are independent of light sources. Family types may be created to represent different sizes of fixtures (parametric) and/or light sources (IES files). It is up to the author of the family to decide how to manage the family types. 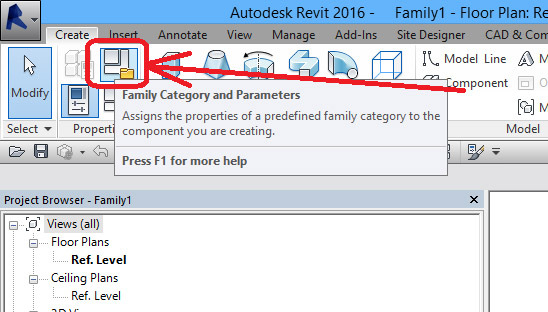 Families are editable, therefore users of the families must adhere to the conventions and practices mandated by their BIM content manager. 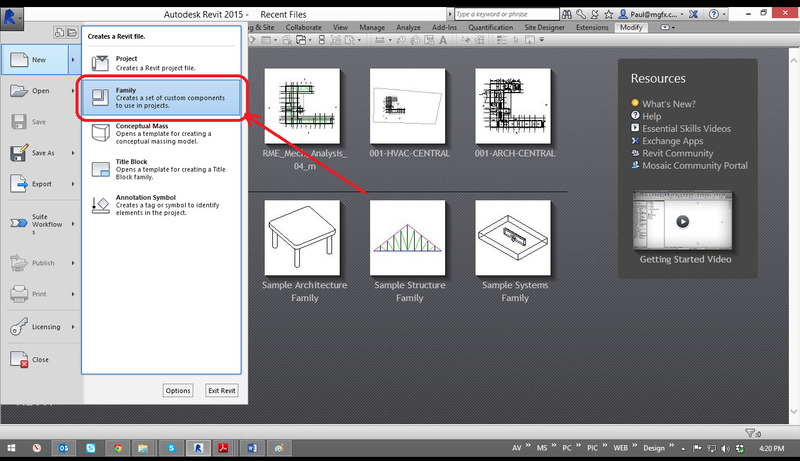 Revit MEP allows a light fixture to have electrical data and connections and may therefore be connected to distribution systems. The room calculation point of the family also applies to the space it is orientated to. 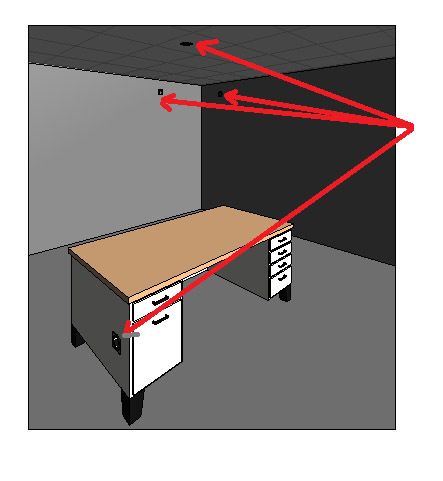 If a light source is contained in the ceiling, but is supposed to be included in lighting analysis of a space below the ceiling, then the room calculation point may be set to accommodate the calculation. A similar argument applies to bulkhead lighting.